The new patented Tapping AFM-IR mode is an exciting new capability that provides 10 nm spatial resolution for chemical imaging along with monolayer measurement sensitivity and extends the capability of nanoIR to a broader range of samples. Tapping AFM-IR retains the ease of use of nanoIR technology, so optimum measurement resolution is achieved easily and quickly. 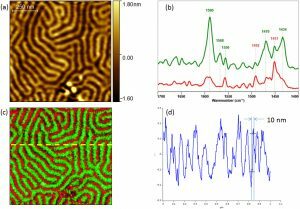 Chemical characterization of PS-P2VP block co-polymer sample by Tapping AFM-IR. (a) Tapping AFM height image. (b) Tapping AFM-IR spectra clearly identifying each chemical component. (c) Tapping AFM-IR overlay image highlighting both components ([email protected] 1492 and [email protected] 1588). (d) Profile cross section highlighting the achievable spatial resolution, 10 nm. 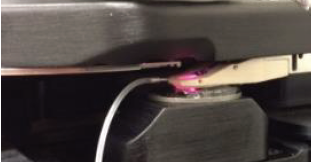 The new high pulse rate OPO laser extends the wavelength range of Resonance Enhanced AFM-IR to cover the 2700 to 3600cm-1 wavenumbers, extending capability to important spectroscopic regions and addressing wider range of applications, while still providing direct correlation to FTIR at the nanoscale. The system sets new standards in resolution and sensitivity. Allows users to study molecular orientation with nanoscale spatial resolution by changing the input polarization of the IR light while studying the associated changes in the nanoscale IR spectra and/or chemical maps at a certain wavenumber. Available on the nanoIR2, nanoIR2-s, and nanoIR2-FS. Provides humidity control in an enclosed environment. The humidity control goes from 4% to 95%, non-condensing. Available on the nanoIR2, nanoIR2-S, and nanoIR2-FS. Accessory for Fluid Imaging. Contact Anasys for upgrades to installed systems. Available on all Anasys systems. Provides heating and cooling over a practical range of 4°C to 80°C. When used with a separate environmental enclosure, a working range of -20°C to 80°C is available. Available on the nanoIR2, nanoIR2-S, and nanoIR2-FS. Available as plug in modules for the nanoIR2-s and nanoIR2-FS systems and provide complementary nanoscale mapping with nanoscale Thermal analysis, conductive AFM and Kelvin Probe Force microscopy capabilities. 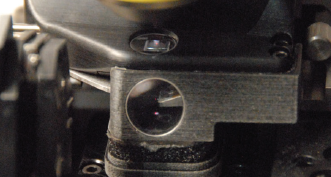 Allows users to switch between OPO and QCL laser sources on systems that are equipped with both lasers. Available on the nanoIR2 and nanoIR2-FS. Allows the user to study molecular orientation with nanoscale spatial resolution by changing the input polarization of the IR light while studying the associated changes in the nanoscale IR spectra and/or chemical maps at a certain wavenumber. Available on all Anasys systems. LCR composite image made by overlying the LCR amplitudes collected at three different contact resonances. These resonances were selected to highlight the varying ratios of the lignin and cellulose which compose the sample. Allows the user to obtain simultaneous height and current flow maps of the sample surface. Available on all Anasys systems. Height (Left) and Conductivity (Right) images of a nanocomposite polymer. Allows the user to obtain surface potential measurements. Available on all Anasys systems. Height (Left) and Surface Potential (Right) images of a nanocomposite polymer. Enables the user to select any point (or series of points) on the AFM image to obtain localized transition temperatures, i.e. Tg and Tm, image the transition temperatures across the sample surface via the mode of Transition Temperature Microscopy (TTM) and collect maps of the sample surface showing variation in relative thermal conductivity or relative temperature across the surface (SThM). Available on all Anasys systems and as an addition to select third-party AFMs. Nanoscale thermal analysis of a PS-PMMA blend deposited on glass. A scan (left) shows indents in the surface caused by temperature ramps (right). The data from the PS (red) and PMMA (green) clearly differentiate the two materials. 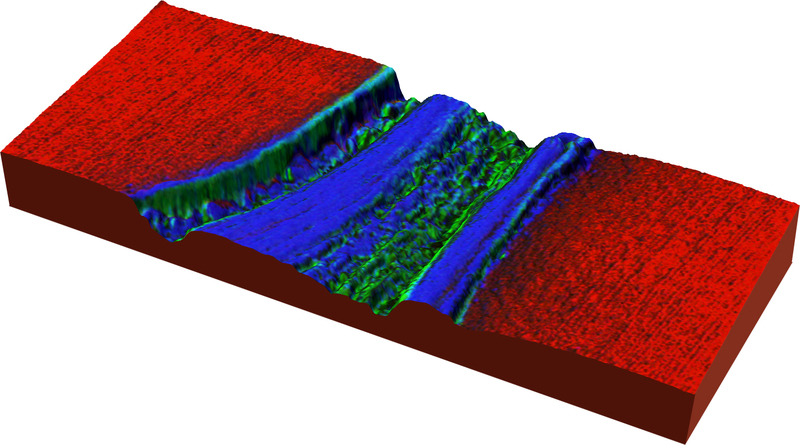 Also shown is data from a thin film of PS on PMMA (blue) showing the initial penetration of the PS followed by the melting of the PMMA. Make new discoveries. Contact us.